When it comes to saving money (and even getting more for your money), the old saying is true: the squeaky wheel truly does get the oil. So speak up to make sure you’re getting your fair share and then some. It’s amazing how simply being friendly and approachable can turn into real profits for your pocketbook. Don’t be afraid to ask fellow consumers in the store for their opinions on products before plunking down your money. Whether the reply is a ringing endorsement or a staunch warning, avoid making a costly mistake on their dime. When it’s time to ring up your purchases, don’t forget the friendly small talk with the checker person either. More than once, I’ve had clerks pull out a seemingly secret coupon that had slipped through my radar or alerted me to unadvertised upcoming sales and discounts. Not surprisingly, being just plain nice can do really great things for your bottom line. The hunt for savings and value needn’t stop once your purchases are made either. If you find a previous purchase on sale within a certain amount of time afterwards, you may be entitled to a refund of the difference simply just by asking. Stores have varying policies, so speak up to find out more. Worried that you’ve lost your receipt? No problem! Many retailers offer receipt look-up as a service. If you use a store loyalty or reward card or remember what form of payment you used to make the purchase, the store can often look up the purchase record in a matter of moments. 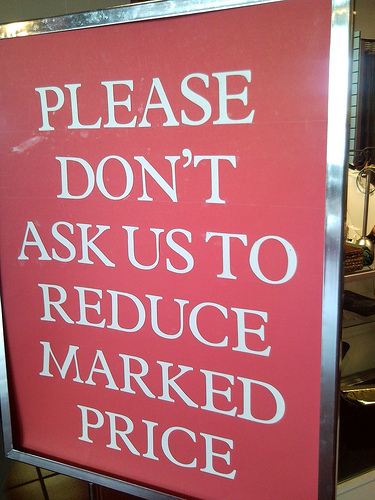 In many cases, the better pricing needn’t just be offered at the same store either. “Price matching” will often be honored retroactively. Again, check with the retailers in your area to learn about their specific policies. Word to the (fiscally) wise, however, price adjustments and price matching are offered as a courtesy and many retailers bank on consumers not taking advantage. Make sure you – and your wallet – do! Avoid reserving your efforts just for consumer complaints, though. If you’re a loyal consumer of a particular product, speaking up and saying so can translate to real savings. Whether you call the toll-free customer service line, visit the company’s website or sign up for product newsletters, making contact with the companies you purchase products from ensure that you’ll be first in line to receive product samples, valuable coupons and even advanced notice of product upgrades and changes. Speaking up can also help keep you in the know when it comes to your credit history and FICO scores. Whenever you are asked for permission to pull a credit report, make sure to ask for the information for your own records as well. While the person assisting you may not be able to send you a copy, they usually are more than willing to answer any specific questions you may have regarding the credit results. Keep a record of the date the credit report was pulled as well as all three scores. (There will be one from each of the three credit bureaus: Experian, TransUnion and Equifax.) Also ask if they could briefly go through any outstanding debts showing or anything that may look not quite right. Doing this can help you keep tabs on your credit history and help protect your ability to get good interest rates in the future. Most Americans are positively phobic about haggling and negotiating over price. In many, even most, foreign countries haggling is the norm and is built into the starting price. It’s good to be nice to everyone when asking for discounts but it’s also a good policy to work up your haggling skills and be willing to walk. Take a page out of the guys on the show “Pawn Stars”, they are pretty decent negotiators but the people who come in are just horrible at negotiating. I also found it is interesting that here we don’t negotiate price, unless it’s something big like a car or a house. In China, pretty much every price is e negotiable. Usually, when buying things like clothes, the price when starting the negotiation is usually half of the marked the price. The problem with this is that we don’t really how much the cloth or anything in that matter is worth because the asked price is always much, much higher. It’s funny you would bring up Pawn Stars. It just happens to be one of my favorite stores. I find it so entertaining (and admittedly sometimes painful) to watch people come in and haggle. I immediately slapped my hand up to my face and shook my head. The pawn shop owner laughed and gave it to him for a buck less – out of pity, I’m sure! Asking for a better price most likely workl better (when shopping locally)if you shop independently owned businesses. Independents have more flexibility than Big Box Chains who have miles of red tape and a home office to go through. I work at an indepently-owned office products company and YES, I always try my best to give a better deal if one is asked for. Squeaky wheel DOES get the grease!